ATV: From ugly duckling to swan. Last year I had three grandchildren. This year that number will double. That’s a lot of pressure on this grand dad because it’s three more grandchildren that I have to try and buy their love by providing them with ATVs as they reach the “appropriate age”. Out growing an ATV is like outgrowing clothes, when a child out grows something, they get a bigger size and their smaller size is handed down to a smaller child. 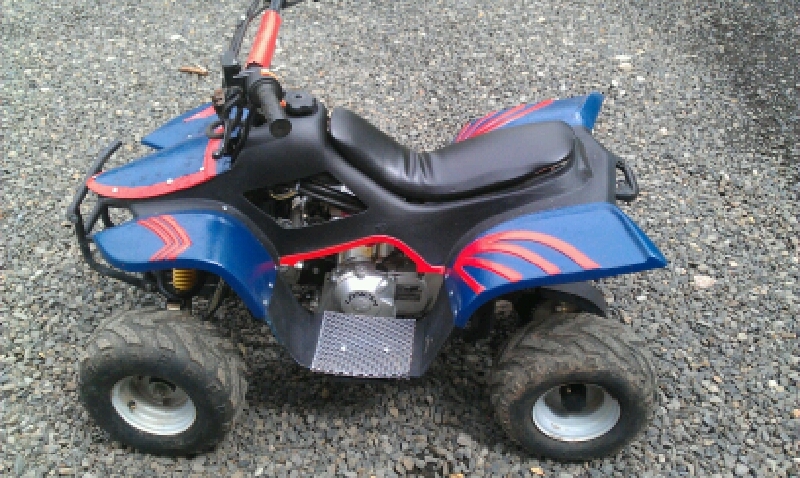 A few months a go I found a good deal, $120, on an ATV that I thought would be a good size for my oldest grandson. His little brother was showing interest in riding, so I wanted to be prepared to…, buy his love. 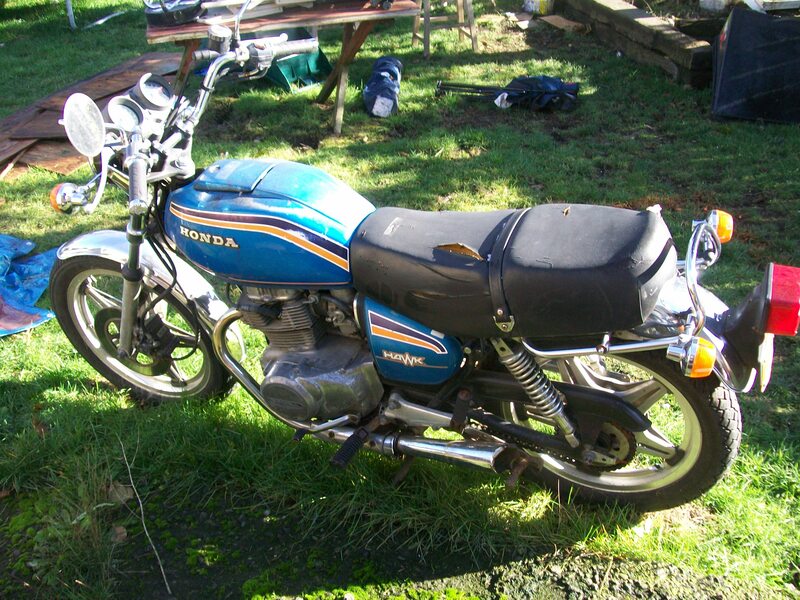 The guy that sold it to me thought it was a 70cc, but after I got it home I discovered that it was actually a 90cc. A little larger than I wanted, but, you know, gift horse. The ATV ran, but it had the wrong size air mixture screw in the carburetor. 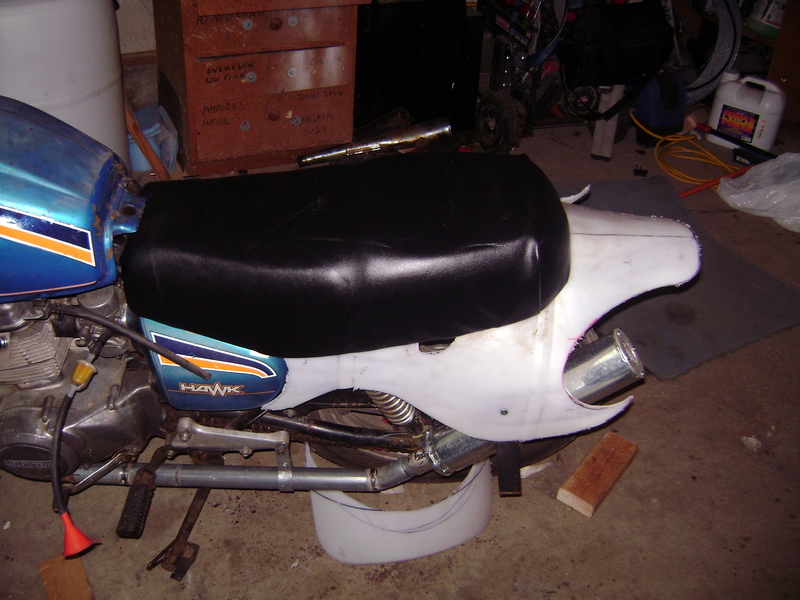 There were other things wrong with the bike; there was no seat, no foot platforms, no hood/battery cover, the back fender was cracked in a couple of places, the plastics were very oxidized, the air filter was missing and it was ugly. I started by making a seat platform out of a piece of a plastic barrel from a paper pattern I cut and fitted. The platform had to have two small tabs at the front and one larger one at the back that would clip into the frame brackets to hold the seat in place. I next made the hood/battery cover and two foot platforms out of plastic from a barrel. 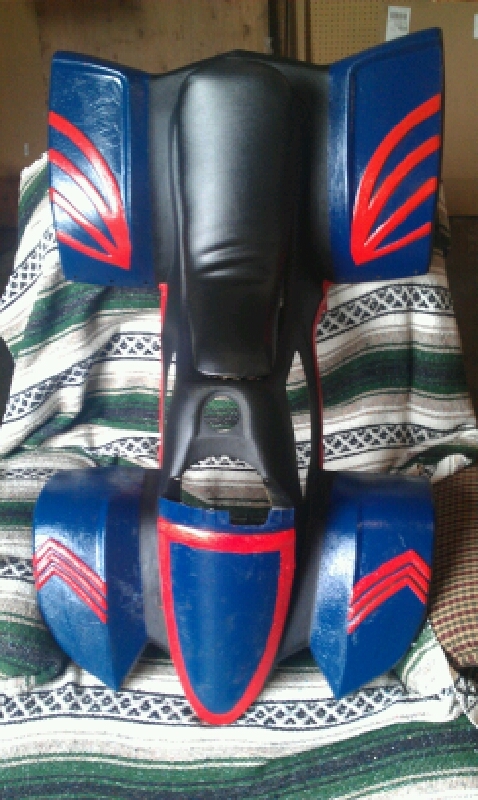 After the seat blank was finished I started with the cosmetics. The oxidation on the plastic had to come off, so I attached a circular wire brush to my drill and went to work. It took some time, but the spinning wire brush took the loose plastic off and I was happy how much better the plastic looked. 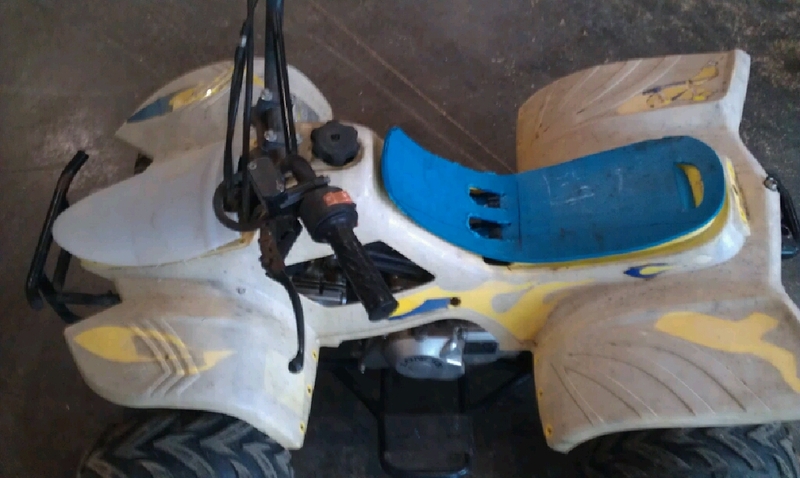 For years my boys and I have experimented with different ways to repair cracked plastic fenders and other plastic parts of bikes and ATVs. Nothing we tried really worked. I knew that had to be something that would work so I scratched my head and looked around the shop for a better idea. My youngest son had left a can of plastic dip in the shop several months earlier. Plastic dip is liquid plastic that you dip handles of tools in, like a pair of pliers, to coat the handles. The can was half empty and when I opened it and found that the plastic dip had started to stiffen, but was still useable. I felt like I would need something to reinforce the repair before applying the plastic dip and remembered that I had a roll of fiberglass tape used for taping drywall joints. The tape is 1-1/2” wide, woven so there is 1/8” gaps between the strands of fiberglass and is sticky on one side. Perfect. I taped the cracks in the plastic from the underside and slathered the plastic dip over the tape. On the topside I filled the cracks with paintable silicone caulk and smoothed it out. After it dried it was very strong and flexible. So far, after a summer of riding, the repair has held with no evidence of failure. Have I ever mentioned that I love spray on bed liner in a rattle can? I do, so I sprayed all the plastics with it. The stuff is so great for sticking to everything and offering a good base for paint. 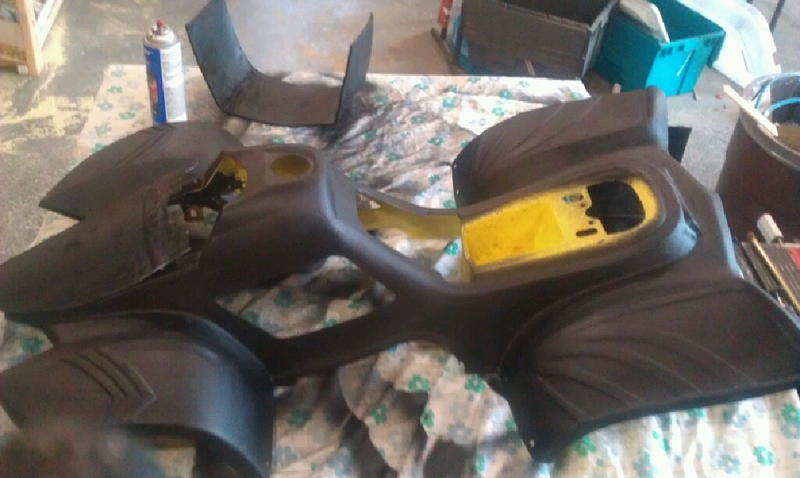 The next step was to cover the seat with foam and black vinyl and to paint the plastics. Many years ago I learned the importance of having an air filter on motor. I bought a Fiat when I was seventeen that had no air filter. I tried to retro-fit different filters onto the carburetor, but nothing really worked. I finally gave up and ran it without an air filter. It wasn’t long before the motor loss power and started to burn oil. 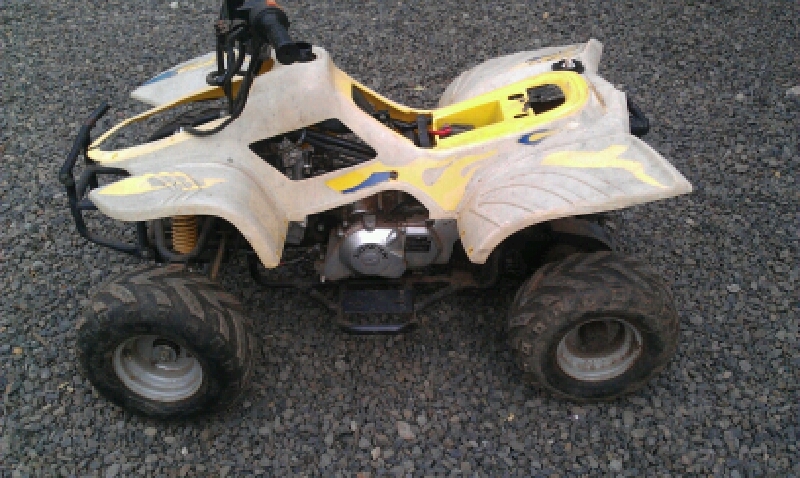 So lesson learned and the last item of business was to make an air filter for the ATV. 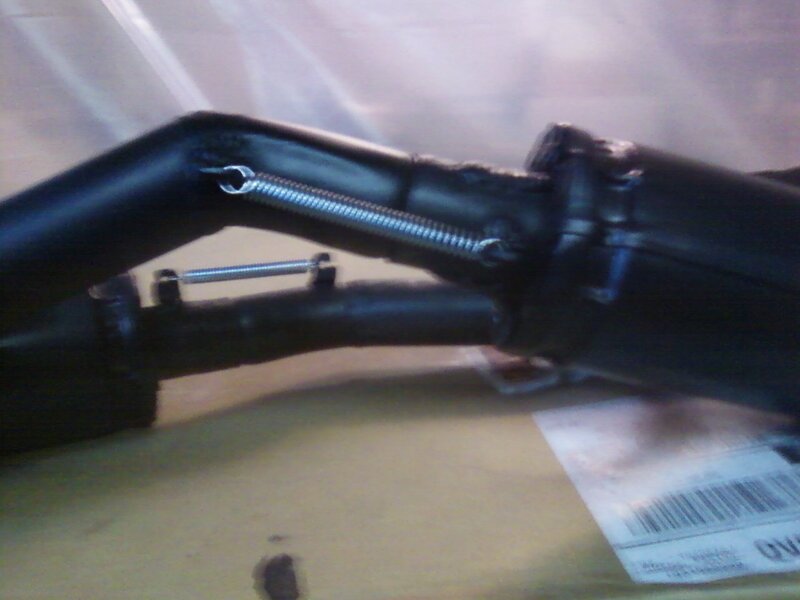 I discovered, after much trial and error, that an 1-1/4” PVC coupling fit snugly over the carburetor’s throat. Then all I needed was some foam, something to hold the foam in and to epoxy it to the coupling. 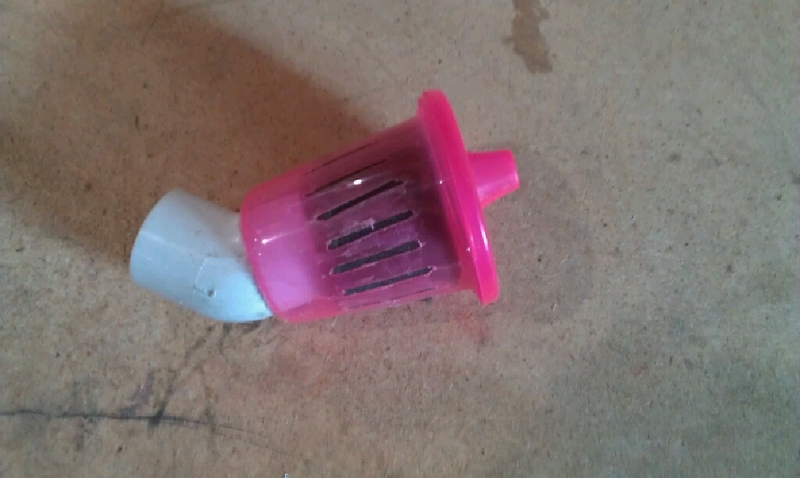 I used a sippy cup to hold the filter foam. I cut slots in the cup to allow for air-flow and assembled it. 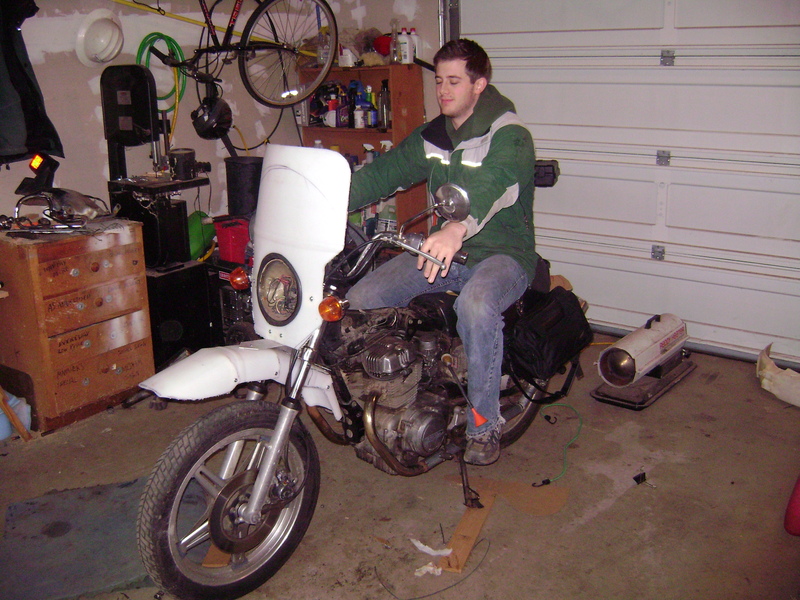 To stay busy and to keep my mind on motorcycles and off the weather, in 2010 I customized a 1978 Honda 400cc Hawk T Type II, converting it to a dual sport bike. I had been looking for a second dual sport bike for sometime. I wanted a second bike to have around for my two sons to ride. They both had street and dirt bikes, but no dual sport bikes. I looked for some time, but couldn’t find a second bike I could afford, or at least, that I could justify the expense of buying. A few days before Thanksgiving, I found a Honda Hawk for sale in Mill City, up in the Santiam Canyon. It didn’t run and looked like hell, but the guy said that it had run last year and everything worked well then. After some negotiation, I traded an old farm .16 gauge shot-gun for it. 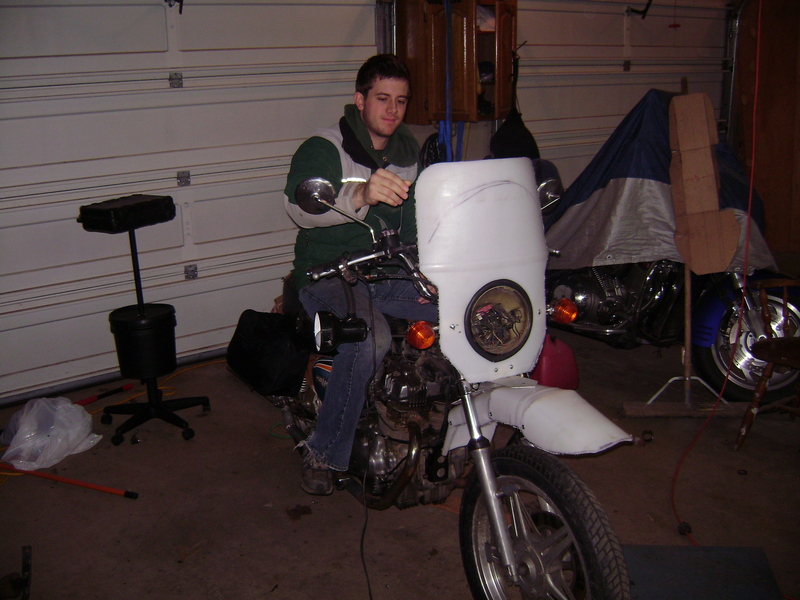 I had never fired the gun and probably never would, so I figured with the trade the bike was cheap enough that if I couldn’t get it running, at least I could part it out and make some money. The first thing I did was clean out the carburetors, charged the battery and to my delight, it started right up. After I got the clutch unstuck, probably stuck from sitting too long, I ran it around the field and up and down the road. It ran great! The tires were almost new, the brakes still had at least 75% left and it only had 50K miles on it. I bought a new horn and one back light bulb and with them in place, everything worked. I decided it would be worth my time to fix it up and try to convert it to a dual sport. My youngest son and I stripped it down to the frame, cleaned it up, changed the oil and started making parts for it to try to make it more dirt-road-worthy. 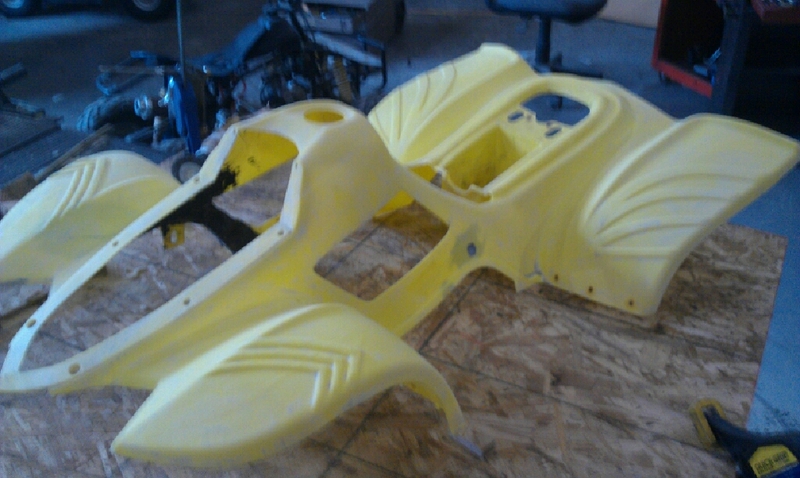 Our first project was to make new fenders out of plastic. The metal fenders on the bike would be too easy to damage. For the past few years be had been replacing broken dirt bike fenders and side covers with ones we make out of plastic from 55 gal. plastic barrels. The plastic can be cut to shape, heated and formed into about any configuration. The stuff it is unbreakable. We made our patterns out of cardboard and once we had them right, we traced them on the barrels and cut them out. We then heated them and shaped them to the bike. The front fender was tricky. We had to shape it to the wheel in two directions, one big arc to follow the curve of the wheel and concave to curve around the tire. As you can see in the photos, we mounted the new fenders high over the wheels like on most dual sport bikes. We had to manufacture several brackets out of plastic and aluminum plate to attach the fenders to the bike. On the back of the bike we installed a hidden heavy, ¼”X1”, steel flat stock bar attached to the old fender mounts, that is bent to run under the fender/side covers on each side and over the mufflers to protect the mufflers if the bike went down. The finish is spray-in truck bed liner. The stuff is tough and will sticks real well if you sand the surface of the plastic before you spray it on. The red paint is just good old Krylon over the bed liner. The mufflers were the fun part. New mufflers would cost a couple of hundred dollars, which wasn’t in the budget. I have repacked a few mufflers, replaced baffles and mufflers didn’t seem that complicated. I did some research on the web and decided to try and make my own. I made the mufflers out of 3” type B gas vent pipe and some 1 ½” steel pipe for the baffles. Type B is a double walled gas vent pipe use for venting things like gas water heaters. In the baffle pipes I cut 4 rows of ¾” long slots across the pipe with the rows running from one end to the other on four sides of the pipe. Then I took a chisel and pounded down the cut pipe one side of the slots, so that as the exhaust and noise runs up through the pipe, some of the exhaust and noise will be funneled into the type B vent pipe. 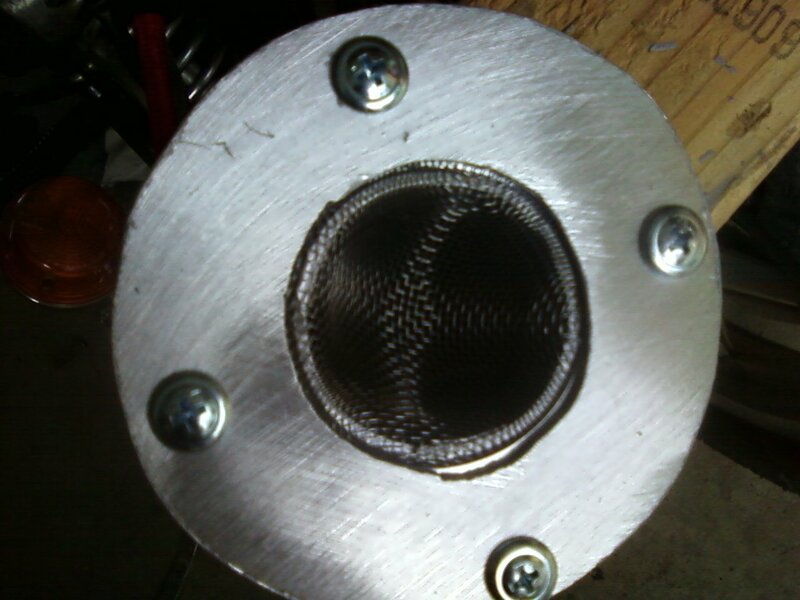 I bought some muffler packing and wrapped the baffles, slipped the wrapped baffles into the gas pipe and capped the ends with aluminum that had 1 ½” holes in them for the baffles to run through. Since we would be using the bike in the forested areas, I installed screen spark arrester that I made from bathroom sink strainers. That is basically it. They sounded great, looked good and were not too loud. We wanted to get the mufflers up and off the ground for clearance. For that, we used 1 ½” pipe from an old trampoline frame to make the extension pipes from the headers to the mufflers. We cut it and wielded it to the configuration we needed to get the mufflers pointed up to the back fender. Fortunately, the extension pipes slipped right on the original chrome header pipes and I was able to use the old header clamps. The muffler baffle pipes slip onto the extension pipes because I used pipe with a bell on one end to make the baffle pipes. I welded some knobs on the extension pipes and baffle pipes and used a spring to keep them snug tight together. I could have used clamps, but I thought the springs looked cool. The gas tank was rusted on the inside and had a dent on one side. We figured we could fix the dent, so we cleaned it out, but discovered that it had a hole in it. 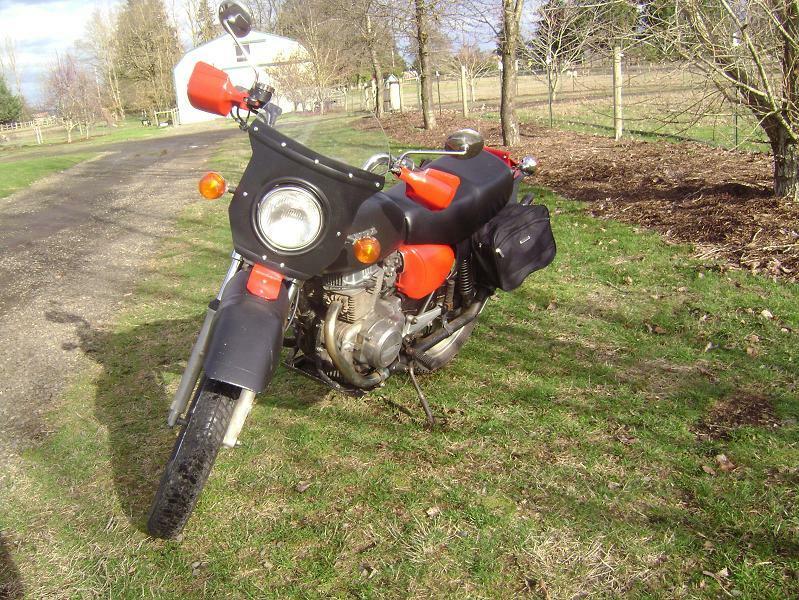 I found a motorcycle recycle yard in SC and ordered one from them for $45.00, including shipping. After spraying it with bed liner and panting it, it looked great. The suspension was a concern since the bike was designed for street use. I did some research on the web forums and found that guys with Hawks did actually use them as dual sports without modification and the bike did real well. Our only modification was that I made a bracket for the top of the back springs to lift the bike an additional 2 ¼” for better clearance. I did also replace the seals on the front forks. The back struts in side the springs were weak. The springs compressed nicely, but the strut banged on the rebound. I solved that by adding trampoline springs, attaching them to the swing arm and frame. The springs were light enough that they didn’t affect the compression springs, but stopped the banging on the rebound. Without dual sport tires, the bike had 8 ½” clearance, which would get better if we had add tires with knobbies. Of course, when you raise the back of the bike up 2 ¼” the kick is no longer long enough. I had to cut the original one in half and made it 4” longer with a smaller pipe that I slipped inside original stand and welded in place. The bike stood fairly upright, but the idea was that when we put dual sport tire on, it should have a slight side tip to it. The hand guards were easy enough. I took these off my XR650L when I added bark busters to the XRL. I had to modify hand guards a little so they would fit, but with the modifications, they bolted right on with the break and clutch levers bolts. They aren’t bark busters, but they will offer some protection to the hands from wind and brush. The front windscreen was made from plastic barrel and a piece of 3/16” plexi-glass that I had lying around. The plexi-glass was cut, heated and bent, then bolted to the plastic. To trim the hole for the headlight I used some old black rubber hose that was a washing machine water supply hose. 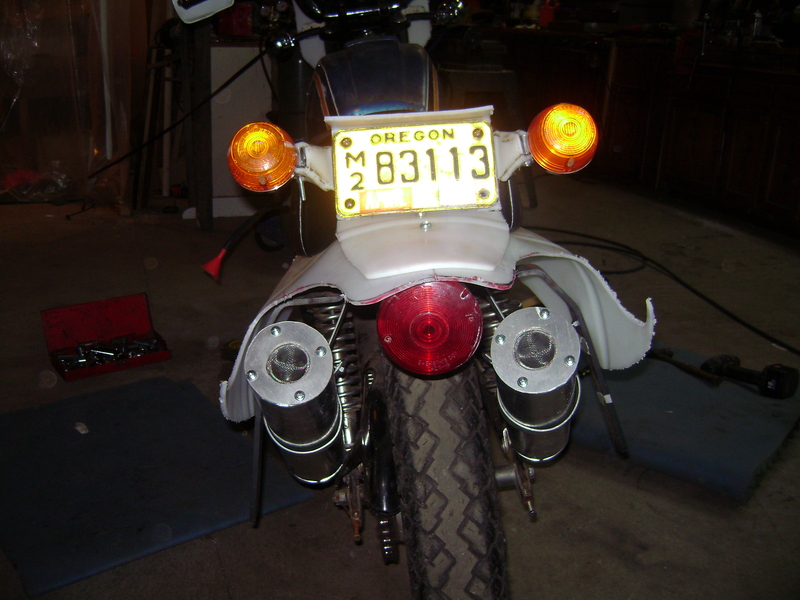 The front turn signal lights were mounted to the front headlight with some very rigid chrome pipes. I wanted something more flexible in case of a tip over, so it cut the pipes in half and slipped some rubber gas line hose over the pipes. To add some additional rigidity to the pipes and to reduce vibration, I sipped some .10 gauge wire down the center of the pipes with the power wires. If the bike goes down the rubber hose should flex at the cuts. The back-turn signals are mounted with the license plate on a bracket my son made from plastic barrel. The license plate light was salvaged from a broken sidelight off my trailer. The tail light was an old tail light off a trailer that was kicking around in my garage. It is mounted under the back fender with a plastic bracket. The seat was in bad shape. We removed the old cover and foam from the steel base. The base was rusted, so we wire brushed it and painted it with stop rust paint. The foam was still in good shape, just wet, so we dried it out and reused it. We use the old cover as a pattern and cut a new one out of black leather-like vinyl. The rock guard under the motor was a challenge. We made the bars out of some scrap ¾” black pipe. Our first attempt didn’t work out. We made the bars too short and we were probably over thinking it. My oldest son “the engineer” came by for a couple of hours one day and helped me rethink it. We ended up using the bars we had made, but attached them differently to the underside. The guard was made out of plastic barrel and attached to the bars with conduit brackets. Notice that I didn’t call it a skid plate. It’s not that heavy duty, but will keep rocks from flying up and putting holes in the bottom of the motor. 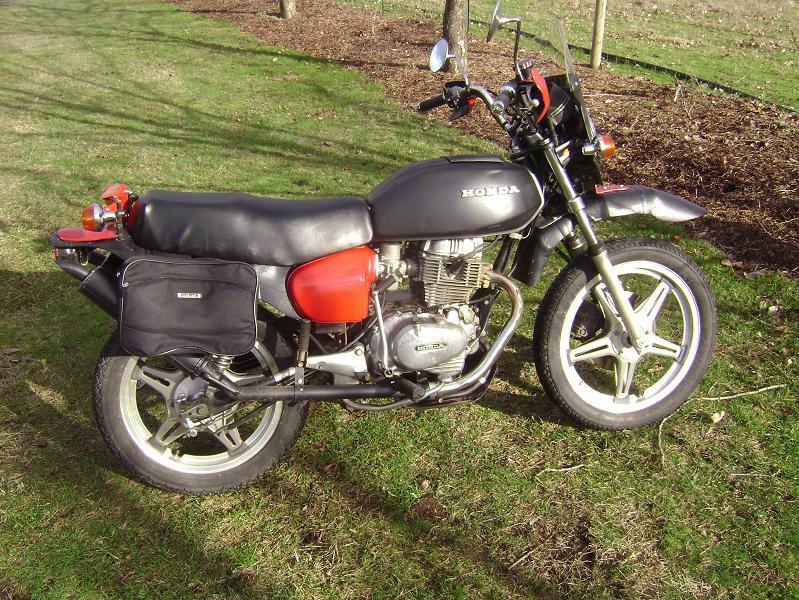 I like having saddlebags to keep emergency items, maps and my lunch in when I’m out riding. I had bought some nice bags for my XR650L on closeout for $20.00. They look a lot like two small carry on or duffel bags strapped together. I stopped at Good Will one day and was lucky to find two black carry on type bags that were almost identical. The only difference is the zippers on the sides are slightly different, but you would have had to look hard to tell the difference. They both are 14”X10”X6”. I cut the handles off on one side and removed the shoulder straps. I cut the other handles in half, put some Velcro on them, ran them under the seat and stuck them to the others bag’s handles that are cut and have Velcro attached. They look just like my other dual sport bags and only cost me $2.99 each for the bags and some Velcro. There really was a lot more to it than described here. This is literally a “long story short”. It was a fun project and like my youngest son said, “These projects are so much fun. It doesn’t even really matter if it works in the end; I just like doing the project.” That’s true for me too. Over the past several years, some of the best times I have had were doing these “Home Grown Engineer” projects with my boys. It is nice though, when they actually work.